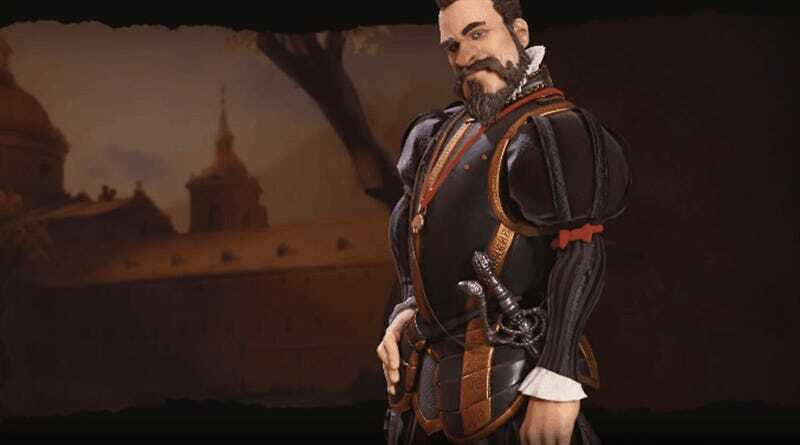 Civilization V is one of the greatest video games of all time, and one of the oft-overlooked reasons why isn’t its “one more turn” systems or balance, but its cartoon leaders. Despite their exaggerated appearance they feel alive, and it was cool to see this aspect of the game not just retained, but improved for Civilization VI. If you’ve seen Westworld, a show about paying human customers hanging out with robots, you’d know that one of the most important things added to the hosts during the series are “reveries”, tiny gestures that seem meaningless in isolation, but which are the finishing touch when it comes to creating believable companions out of AI. It’s not a cowboy hat or eye colour that truly brings the hosts to life, it’s the little things: a flick of the hair, a quivering lip, a lingering touch. 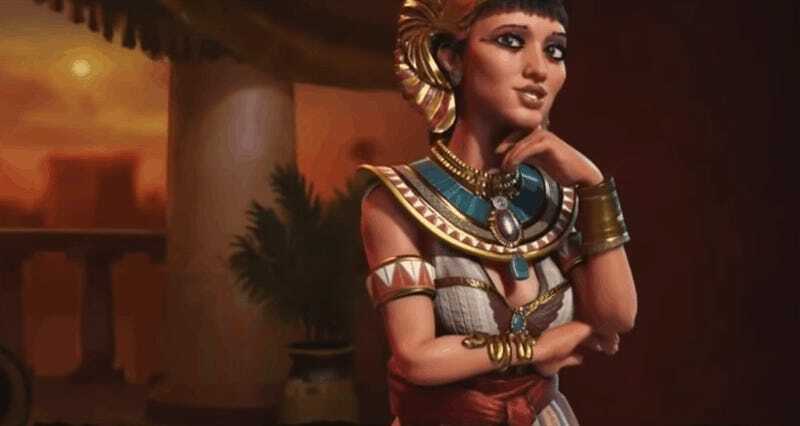 Firaxis’ animation team have done the same thing with Civilization’s leaders in the last two games, breathing character and emotion into every leader, which has the effect of turning dull negotiations with a (relatively) simple AI into something that feels much more human. Civ V’s flamboyant arm-waves were good, but the work done in Civ VI is simply breathtaking. I’ll often find myself glossing over the actual point of an AI discussion, as I sit fascinated by every little move and gesture being made by a piece of code. 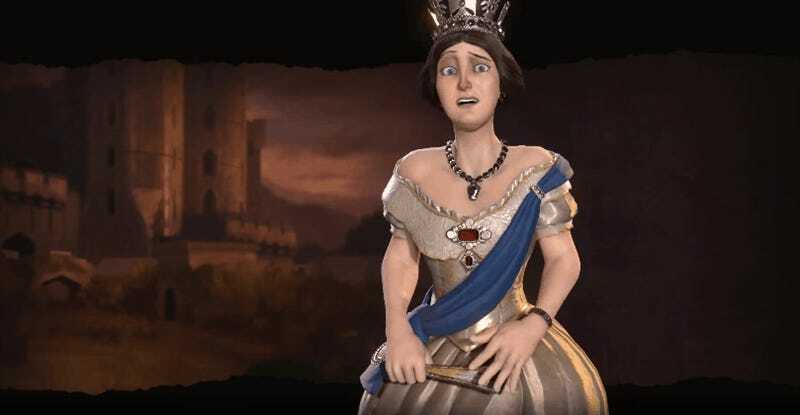 Where other games would simply opt for a few pieces of canned animation, or only bother moving the character’s lips and head while talking, every discussion in Civ VI brings about a hurricane of movement, with opponents waving their hands, craning their necks, pursing their lips and even turning away from you. Most impressively, this isn’t done robotically, in a way that lets you see the beginning and end of a loop; it’s so smooth and constant, hands moving at the same time as arms, shoulders, neck and head, that it looks truly organic. Not real in of itself, these are still cartoons we’re looking at, but exactly like a real thing would move if it didn’t look like a caricature. The wonderful hair and fabric textures help here, but the main things to thank are each character’s expressions and movements. Their entire faces contort in emotion, pinching and shifting, while hands—in most other games little more than static claws—move constantly, each finger independent. Note how her entire body shifts, from hips to shoulders, while her chest arches and fingers—even on the hand you’re not drawn to—move. Also note the face, with its arching brow, expressive lips and suggestive gaze. This is all for a single line, taken from her first introduction to the player! She introduces herself as “Isis reborn” and “the living Nile”, all bluster and bravado, before saying (as her fingers run down her neck) she could be an ally...”if you are worthy”. 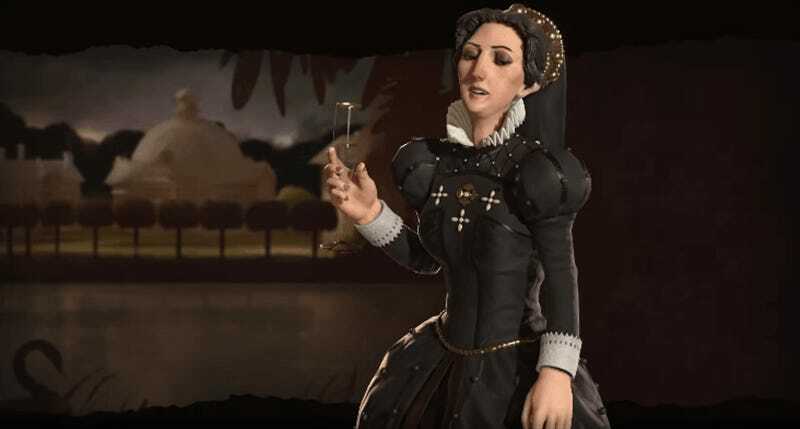 It’s a shamelessly seductive pose for the line, but then, that’s the entire fun/point: this is a ruler most famous, rightly or wrongly, for her looks and hold over men in power. And that entire hook is summed up here and conveyed to the player in just a few seconds of movement. Another great example is Philip II, who is always waving something around while gesturing madly in your face. Look at the medallion swing around his neck here, and the way he raises his eyebrows before adjusting his pose so that he makes sure the sword is pointing just right. My favourite, though, is Victoria’s absolute meltdown when she’s upset with you, already made perfect with her grasping and turn, but improved further by the scowl at the end. To get a real good look at what I’m talking about, xLetalis has compiled a few videos showing off the range of leader animations. 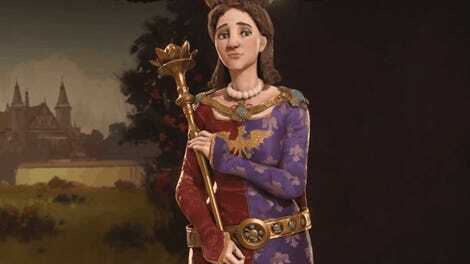 Don’t let the Cleopatra thumbs dissuade you, the vids cover every leader except Jadwiga, who has only just been released.